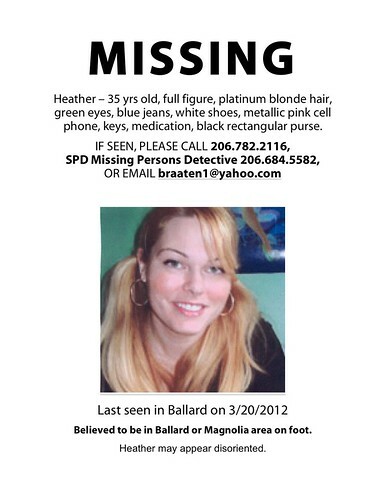 Missing Person - Heather Braaten - disappeared 20th March 2012. If you're a regular reader of the variety of major LEGO blogs out there, you've already seen this, but I'm passing it along on the theory that at least some of my readers come from outside the hobbyist community. Heather Braaten, who you may know on various online forums as HeatherLEGOGirl, has been missing for the past week. She was last seen in Seattle, Washington. If you see Heather, or know anything of her whereabouts, please contact Lino Martins at linotopia AT hotmail DOT com , as he is in close touch with Heather's family, or directly contact the Seattle police department. Or use any of the contact information on the flyer below. I have been asked to look at Tarot for Heather Braaten and have printed the above information as if you are aware of any details you can contact the above link for details of how to get in touch with your tips. Tarot may be able to give 'glimpses' of the situation in past present and future modes. Generally Tarot will 'dump' all the information out so we do have to try to pick out what may be useful to helping Heather and where she might be or what is around her circumstantially. Tarot is not 100 per cent accurate by law so I have to ask you to always consider reading the facts to the situation and for that reason ask you to check them elsewhere. Lets see if Tarot can tell us 'something'. Whenever I ask Tarot a question it does tend to tell me 'something else' it wants me to know so I do have to 'go with it' and this first card given is the four of Pentacles. Now heres a pretty startling coincidence about this card appearing. For one thing it is suggesting someone who 'lets go' of everything, their material possessions and everything that they have including running away from people. Note that Heather is linked to 'lego'? This could be a definable link because this card is about having suspicions about people , not trusting others with her personal 'things' that could include material possessions or even her own personal business. It shows her shutting down from others and trying to place her identity someplace else. But its also a card about financial problems too and being poverty concious even neglecting financial responsibilities. So, did she have a problem with finances? or did she not want people to know certain things about her? There is something here that makes me feel that she thinks she 'lacks skills' or abilities for certain avenues and cannot sort things out because it appears she is weighing everything up and just being overwhelmed by people, money and circumstances and she really needs to make money fast either her or someone else anyway. Did she come across anyone unscrupulous who might have taken advantage of her personally or financially I wonder? A letter G might come up here. Incidentally this card is normally North but it can be South reversed. There is a lot here that COULD be the situation but all I can do is just give all the possibilities. For example, she might have been seen on camera but whether that has come to light or not I am not aware but the possibility is here. There is also a possibility of a guy around the age of 30ish that might have turned out to be less then friendly though appearing to be nice on the surface of matters. Heather might have been walking and this person also but these cards can lead to robbery, insecurity and someone with bad intentions. It can also tell us that someone was 'thrown out' of somewhere too. I should add here that this can also include 'abandoned buildings' which could show up . In general what I am getting is losing things, losing money and losing status here but someone who needs to make money fast. That can be Heather or someone else which might leave her unprotected. I cant guarantee this is an exact scenario but its possible and so are college/school names, fields, farmers fields or business premises in surrounding vicinity as you can see that the original card shows being out of town but it might still be around the town that she is seen in this card. There are rural aspects to this card though. Number 4 must be important here. I do seem to sense a loss of money. Jealousy envy and greed could very easily come up here . This card can make you lose your job and you have to go and find another one but its also a card where people who are jealous of you and your status can make problems for you too so perhaps this is not about a stranger around Heather but maybe someone she connected too. Remember also that Pentacles are not just health cards but work cards and when it is coming up like this even money that is due is not going to materialise either because something has stopped that or someone has tried to take something from you. On the other hand if Heather has received money from anywhere (not what I first thought though) someone could be trying to get it off her. In general it shows she is cut off from the world at large so we need to see what else Tarot can say to help here. Im not sure I was expecting this particular card but as you can see it is a water card and suggesting West as a location. This is a card of UNION whether a name place or not it shows two people in this card and some kind of 'invitation' , it looks romantic on the surface of it and there are a group of friends perhaps three in the next card so that has made me think. Clearly she is connected then to someone she knows at the current time? at least I would get this impression. Here also we have a very watery card so we have to look at locations that have water in the vicinity or we have to consider names of places that have water in them. Bridges can show up in this run of cards, buildings by water or water crossings. There is a doctors symbol in this card via the caudecaus but I really cannot say how that would blend. Meanwhile Im wondering if someone now has asked her to go somewhere? I seem to see her going towards 'home' wherever that might be or perhaps she is definately in or going towards her own hometown as I do see that looming up in this set of cards. So perhaps near water, river or creek . Boats/lakes can come up so I cant dismiss those but they are not strong on this first card only that they might show up. There could also possibly be church names but somewhere in the vicinity. If I received this card first I would feel quite happy about Heather because it is an upright cup and its a pleasant card but here its describing her surroundings which could have initials M or W and there could be water features here such as waterfalls, fountains or something like that. I will try to look more at location soon but here we have the number 2 and it does seem to be hometown - place of origin and what appears to be WEST in direction or name. This card seems to suggest that Heather will only be 'mislaid' for a time there is a three here so it might indicate she could be found within a 3 or within 3 months . If not a timing then a distance. But looking at this card it is a bit morose because it seems here that three people have fallen out. Did she have a romance with someone and there is another person involved such as a three way relationship? its possible, but looks like someone is going to have come forward here and tell some truth as this is a card calling for painful and honest communication. Hopefully that means someone is going to come forward. This card can indicate difficult things, the Ace of swords can indicate injections and cutting which is not very nice but I have to mention that as even drugs can come up on these cards and that can mean medicinal or recreational. The overall feeling here is that it is pretty downbeat and some upset feelings I am sensing here. It does not bode well for health matters but at the same time this could be mental problems and not necessarily physical hurts however, we do have to think of both. This card is generally East when its upright but we are getting this reversed so perhaps EAST is part of a name as we do have West come up quite strongly. Im not sure right now if its a name or direction so I mention both. There are some arguments here where nobody has turned out to be a winner. I think there might be a church name somewhere it has come up a couple of times and water/stone rocks is prevalent so I think that we have to think about those properties. Someone here seems to have a broken heart. I really feel there may be information about Heather soon. I will attach location thoughts in the next while and if I think of anything else I have missed (and I do miss things in a brief overview) I will post them. I feel as though someone might have betrayed Heather's trust. I have no idea if any of this will help and Im sure that not all will apply but maybe something here might ring a bell? I feel as though there is some bad relationship in here somewhere which could involve three people. This card is a HEART so if there are any significances to the word HEART -Hart in the area maybe that could be useful? I think WEST could be important though. Airports/Hills/Railways, Water, rocks and stones could all be part of the vicinity also. Below are indications of the kind of places that might be associated with Heather or are in her vicinity at any given time and descriptive of place that she might be found and type of location. The directions appear to connect to her are NORTH, SOUTH AND WEST. It does seem to follow Tarots advice. Farms, farming equipment, wood stores and places where farm animals roam. Fallow or bare land, barren fields, land bushy and thorny, or where there are dunghills, compost heaps or soil prepared with manure. Locations that are low down, on or near ground, low dark places can also be docks or shipyards or storage areas. Places that divide / contain rooms or territory; example are walls, garden fences, gateposts and international borders. Also considered , Mausoleums, church yards and ruins. Inside the house it is a low dark corner, on or near the floor, doors, closed in or confined spaces,and those associated with waste disposal. The sea, rivers and places near ponds or waters - brooks, springs, wells, wash-houses, sea shores, marshy land. Inside houses may be cellars, cisterns, bathrooms and places near water. Mountains and hillsides. Places to do with being HIGH up and to do with Air windmills air force bases, airports, communication towers, wind power or places where hunting and hawking is used . Other considerations gravely ground, saw-pits, places where wood is cut/stored,, barns, outhouses away from main buildings. Inside buildings,places near windows or off the floor towards the ceiling, ventilation ducts, the upper rooms in houses, attics and rooms that lie inside others, ie walk-in wardrobes. Directions SOUTH - NORTH - WEST. I am very sorry to inform you of this sad report below. I did feel that we would hear news soon. There are no other details at the current time. It was very nice of you to do this.